In this tutorial, we’re going to talk about the spinal treatment recommendations that AcuGraph makes. When you’re looking at the graph you can click on the Spinal tab. Here, you’ll see a picture of the Spine with some areas shaded. The shading has several different degrees of red, and some areas are not shaded at all. The more shading and the more red that you have in a particular area, the more likely there is to be a spinal issue there. These issues may be fixation or subluxation, or a lack of proper movement. This information is based on the findings of the AcuGraph exam. 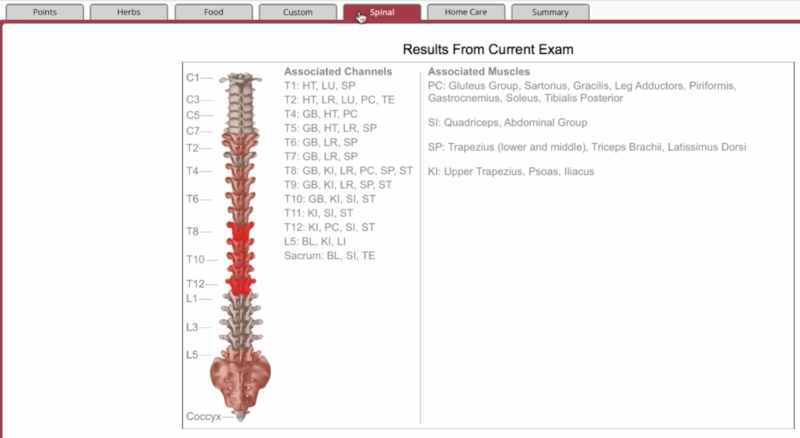 Of course this doesn’t diagnose a spinal problem, it only tells you areas that you might want to examine. Also, this lists muscles associated with meridians where an imbalance is detected. You can use this to consider and identify potential musculo-skeletal issues and help correlate the graph results with your findings. This is one more way AcuGraph 5 helps you be a better practitioner and helps the patient understand and comply with your treatment plan!